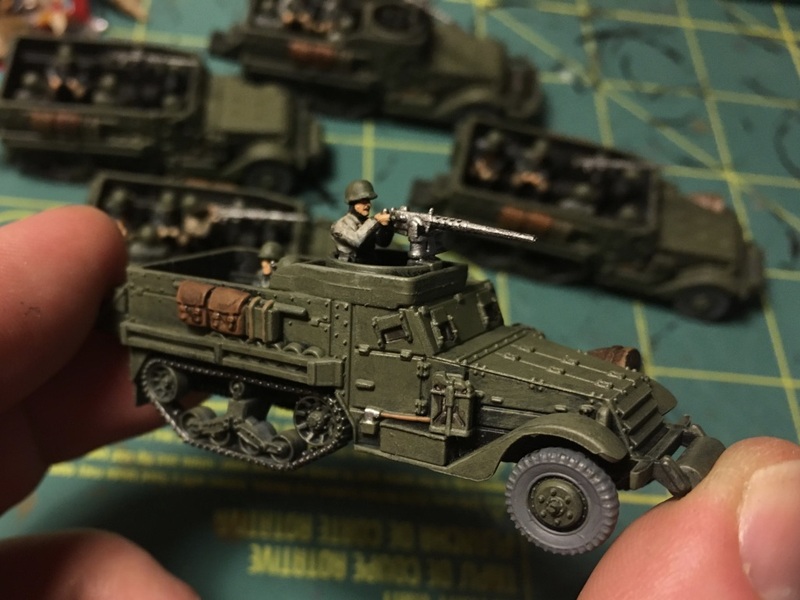 15mm M3 Halftracks… for VASSAL! I’m on a bit of a Chain of Command / Battlegroup kick at the moment, which has led to a lot of time spent editing a VASSAL module for these games. It’s great playing games on VASSAL, but things can start to seem quite intangible. What do I mean by that? Well, a game on VASSAL is very close to a game on the tabletop. In fact it can be more accurate in certain ways – the movements are crisp and the dice rolls are easier to keep track of. The main (intangible) downside is that you’re playing with virtual pieces. The models are just sprites and while I’ve spent time editing them in Photoshop, it’s not the same as owning physical models. One diligence I try to maintain is to only use models in VASSAL that I own (and have painted!). This might seem a little odd, but it means the experience in VASSAL transfers directly to the tabletop. So… that was a long preamble to show off some models that I hope to use in VASSAL soon! I picked this up at a wargaming flea market in Hamburg on my last visit, it was all made easy because they allowed that you borrow from them and pay back after you get paid which is always cool. Their the PSC models and were already assembled (which was great as it’s the part of wargaming I like least). This is a quick paint job and I still need to do the decals, but at least they’re ready to play in VASSAL!